Richland County, WI: The flooding that has once again hit Richland County has been seen to have a negative impact on many residences in our area. Damage assessments are ongoing, as the waters continue to affect roads and property. Richland County Emergency Management encourages individuals impacted by this flood event to photograph and document any damage to their primary residence. Thorough documentation of damages aids individuals in experiencing a more favorable recovery process. Individuals who wish to report damage to their primary residence are encouraged to call 608-649-5767. This line may also be used to report other non-life threatening situations. An operator will be available between the hours of 8:30am and 5:00pm today (Thursday) and tomorrow (Friday). Resources also available to residents include clean-up kits from the American Red Cross and sandbags. Those wishing to obtain a clean-up kit can go to Richland Center’s Community Center, located at 1050 N Orange St, Richland Center, WI 53581. Limited quantities available but more are on the way. Upon their arrival, clean-up kits will also be available in the townships of Hub City, Port Andrew, Rockbridge, and Yuba. Sand bags are available through the municipalities and Emergency Management via the number listed above. Individuals seeking more information about public health concerns such as wells or sewers may call 608-649-5752 to speak to the public health representative. Individuals who would like information about road closures and alternative routes may call 608-649-5766. 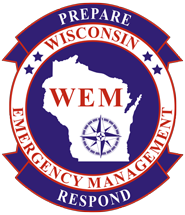 We encourage the public to monitor the Richland County Emergency Management website http://em.co.richland.wi.us and their favorite media outlets to stay informed of changing road and weather conditions.